Your wedding is one of the most important days of your life. All eyes will be on you as you make your way down the aisle, so you will want to make sure you look and feel your absolute best. After you choose the perfect wedding dress and accessories, you will need to decide what to do with your hair. 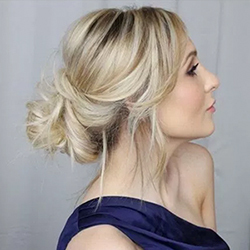 Whether you want a classic ponytail or a contemporary-style bun, Rinaldo can help you rock any of these wedding hair trends! This modern take on a wedding classic is all about creating an effortless look and feel. Despite the intricacy, low updos are perfect for the bride that doesn’t want to look overdone or overwhelming. From draped twists and braids to artfully arranged curls, a low bun can be tailored to any bride’s style and looks gorgeous from any angle. 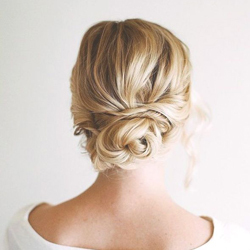 Wedding buns have always been chic, but adding wispy tendrils has somehow made them even more gorgeous. It’s the perfect balance of structured yet feathery soft, and leaves you feeling polished and beautiful all day long. Brides can also opt for hair pins and accessories tucked into the side for added personalization and style. 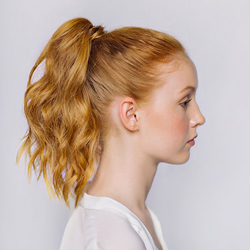 A glamorous high ponytail is sure to be a show-stopper as you walk down the aisle, especially with soft, gorgeous waves. For a more polished and romantic look, we can plump up your pony and wrap a strand of hair to cover the elastic. Feeling something a little more bohemian? Braided and knotted iterations are also always in style! 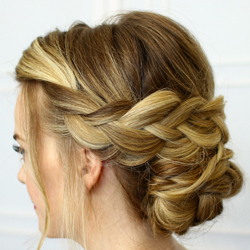 A wedding is the perfect occasion for braids. This always-in-style technique looks good on all lengths and textures of hair. Whether you are incorporating braids into a half updo, part side-swept look, or want a Grecian-style full updo, braids add instant romance to any hairstyle. Our stylists can also loosen short layers for an even softer finish. 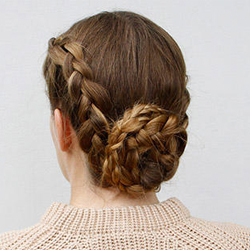 Put a twist (and a braid) on a traditional chignon. This is one of our favourite wedding hair trends of 2018. Inspired by the runway, a braided chignon is achieved by twisting and weaving together multiple strands of braids and working them together to form a low bun. Polished and ornate, this looks is sure to leave jaws on the floor. Our talented hairstylists understand all the latest trends in bridal hairstyles and can help you achieve the perfect look for your special day. We encourage you to book a consultation appointment to ensure you get the exact hairstyle you envision.